Here in the UK we are coming up for the effigy-burning, firework-displaying extravaganza that is Guy Fawkes Night. Also known as Bonfire Night, November 5 commemorates the evening in 1605 that 13 young men had planned to use 36 barrels of gunpowder to blow up the Houses of Parliament. Poor old Guy Fawkes should have stayed in the ye olde tavern because not only was he caught, tortured and executed, we now have a rather gruesome tradition of making effigies of him to burn. Or rather they do in England. Up in Scotland it’s just fireworks and hard cider (any excuse really). Truthfully there are probably more than a few people celebrating his and his co-conspirator’s bravery and (drunken) idea rather than celebrating their execution. And more than a few who have no idea what it’s all about but who like stockpiling and setting off fireworks in a socially sanctioned way. In our neck of the woods, for about a week now, sporadic, half-hearted displays have been shooting off as soon as the sun goes down. Calendars are obviously passe these days. But Bonfire Night is always quite something. In a couple of days’ time we will be getting sore necks from craning them skyward. And our bellies will be stretched with socially sanctioned Bonfire Night food: my Mexican hot chocolate, some warm soup from a flask, bangers and mash (I am already anticipating a request from Mr A who, I swear, could live on mashed potatoes) and this cake. To be followed by a week of tofu and steamed vegetables. LOL. Other Bonfire Night foods that are popular around the country include Cottage Pie, Bonfire Toffee (the dentist’s favourite), foil-wrapped bonfire-baked potatoes, Scotch eggs and toffee apples. Not the healthiest of feasts, but they are all foods that hit the spot when standing around in a foot-stampingly cold – and probably damp – field. I think pretty much anything warming and vaguely portable can take a spot on the Bonfire Night table. The only non-negotiable is parkin. I don’t think many would argue with me on this. But the thing about parkin is that it is not a last-minute ‘ooh I’ll just bung something together’ kind of cake. It is very easy but it does need to be made in advance. A good three days, or a few more. So if you are reading this and planning to celebrate (the execution, or the drunken idea), get stirring. If you have never eaten or made it, you are in for a real English treat. I was first introduced to parkin by Mr A’s grandmother, affectionately known as GG. Although born in Edinburgh she lived many years in Yorkshire and, as well as being able to switch on a broad Yorkshire accent at the drop of a (cloth) hat, she was a mean baker, and this was a specialty. We all miss her very much, she really was a wonderful, vibrant lady, but we have her recipes to help remember her. And at this time of year I feel she is right here with me while I make this cake. I have adapted GG’s old recipe but it is essentially hers. Heartily recommended for eating most anytime, not only on Bonfire Night. Just add fireworks. 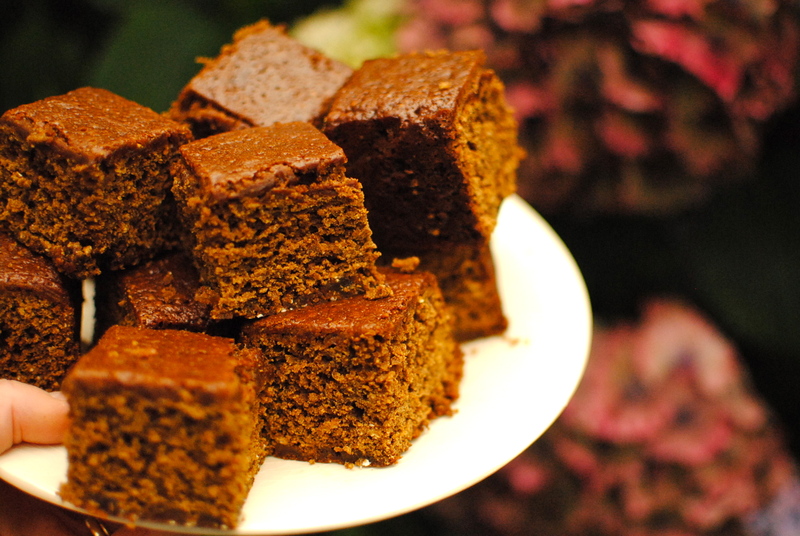 Parkin, whose origins are as dark as the actual cake, is essentially a Northern English gingerbread, but much stickier with a hint of liquorice from the dark treacle. It is made all over northern England but the Yorkshire version, with its inclusion of deeply nutritious medium oats, is the most popular and, imho, the most delicious. 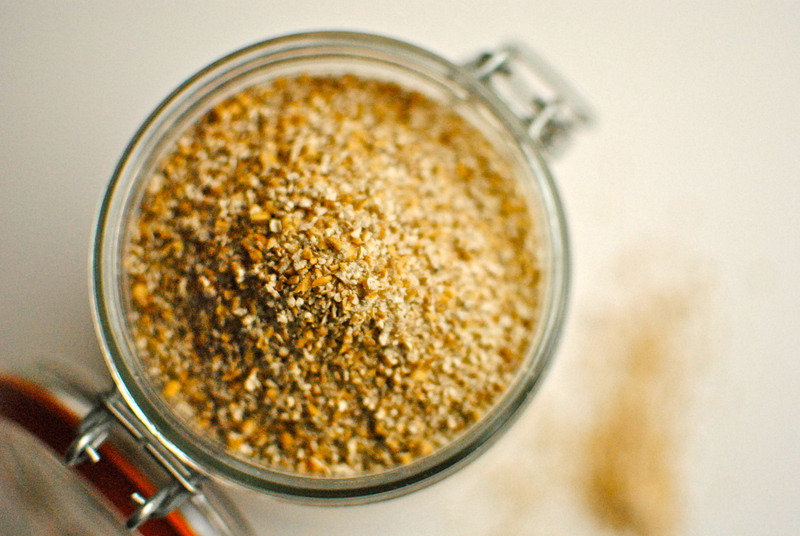 For any of you outside the UK, pinhead or steelcut oats, whizzed briefly in a food processor to get a finer grain, will do just fine. Bob’s Red Mill carries what we call medium oatmeal, but it’s quite pricey. 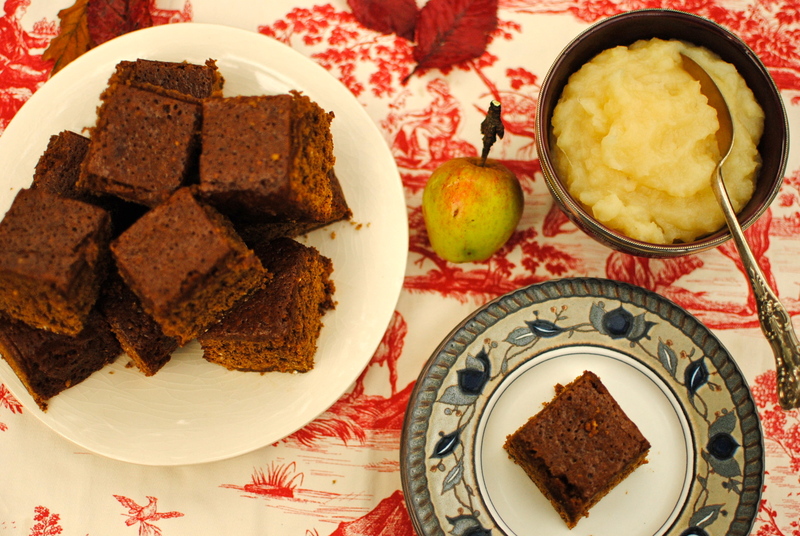 Although it is traditional to have parkin on November 5 for Bonfire Night, it is of course suitable for eating any time, any place. 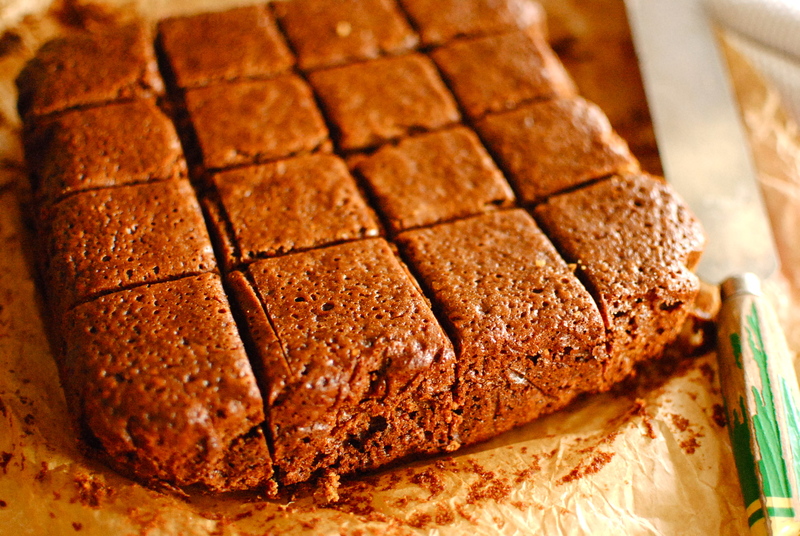 The key to fabulous, sticky parkin is to leave it to mature, tightly wrapped and airtight, for at least three days. A week is best. Enjoy it on its own, with this compote, some custard or whipped cream. And you have to have a strong cup of tea (Yorkshire Gold perhaps?). I hope to take ours out of its shroud of crinkled paper and into the garden to enjoy while watching the neighbourhood fireworks. Any leftovers – crumbs probably – will get fed to the hens as a reward for surviving the noise. Poor things! Cute pic of them below. To make: Oil and completely line a 20cm x 20cm/8” x 8” baking tin. Preheat oven to 140C/275F. In a large, heavy pan gently melt together the butter, treacle, syrup and sugar. 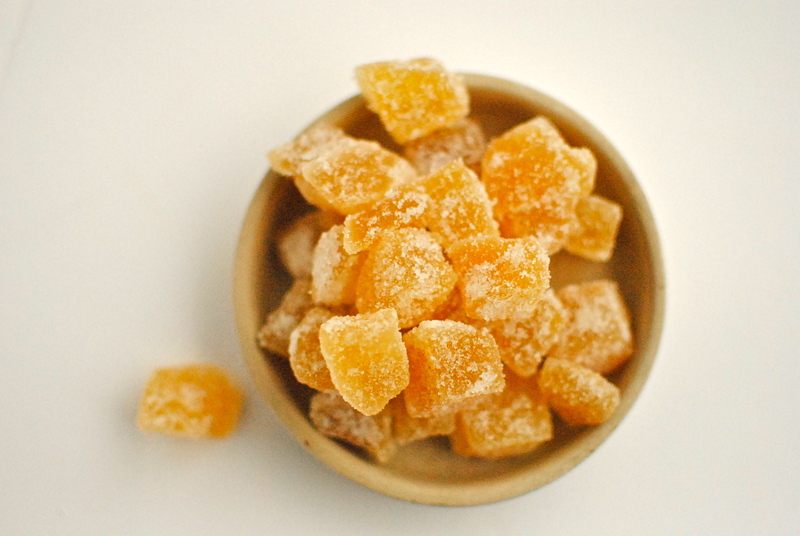 You just want the sugar to melt – no boiling please. In a large, wide bowl whisk together the dry ingredients. Make a well and pour in the warm sugary mixture, stirring well to make sure everything is wet. Now whisk in the eggs and milk. It may take a number of strokes to get it amalgamated, but it will come together in a fragrant, impossibly sloppy batter. Pour the parkin batter into your prepared tin and bake for 1 ½ hours until it is completely set and an inserted skewer comes out clean. It should be a tempting deep golden brown. Take the parkin from the oven and let it cool in the tin on a wire cooling rack. At this point some bakers remove the cake and paper and wrap it in fresh paper and smother it in tightly wrapped foil. I just leave mine as is but wrapped in two thick layers of foil. Now, the hard part. You know how good it looks and smells, but you are going to have to bite the bullet and tuck the parkin away somewhere dry and cool. Leave it for at least three days, but up to a week. The flavour will mature, the cake will become gloriously, finger-lickingly sticky, and the moistness will be perfect. If you dare to pinch off a piece after baking, it will be kind of dry and ordinary, so please wait. It is worth it. In season, I always make apple compote from my garden’s apple tree, which seems to be a cooker-eater cross. Due to earlier poor weather this year’s crop is skimpy and the fruit miniscule, but luckily the taste is still very fine; they are just a pest to peel. 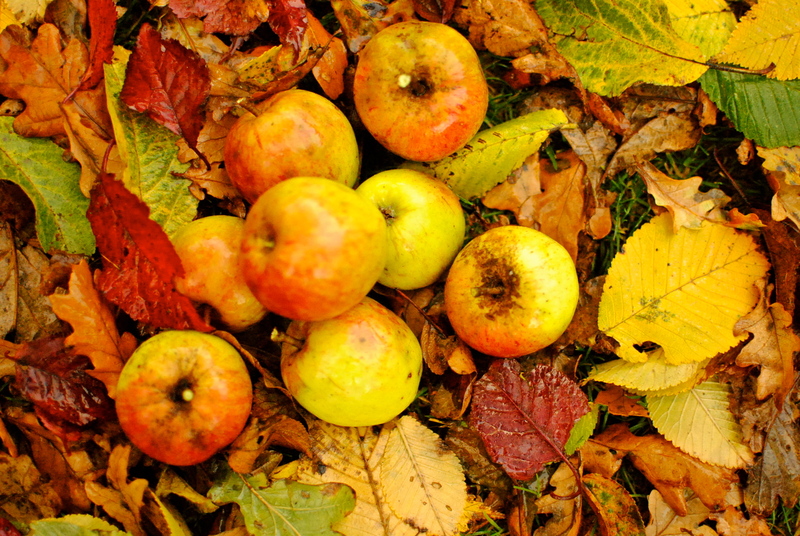 Traditionally one uses cooking apples, which are more tart than eaters, and ‘fall’ to a delightful snow-like mush. But use any apples you have, adding a touch of lemon juice to eaters and mashing them if they don’t fall. 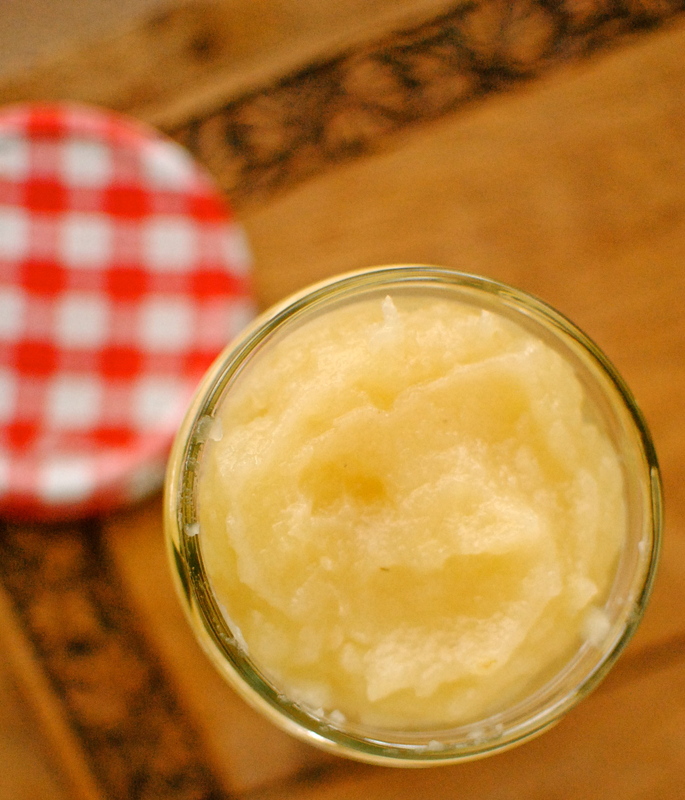 I like texture in my applesauce, which compote is really, but if you don’t, just use a hand blender to get the texture you want. Add in a touch of cinnamon too if you like. Btw, the butter is optional but just the tiny amount I have listed makes a huge difference to the taste. Don’t know why, but it does. To make: Peel, core and roughly chop the apples. Pop these in a heavy saucepan with the water, agave/sugar and vanilla. Heat gently for 15 minutes, stirring occasionally. Stir in the butter. If the apples are still quite wet cook until the obvious moisture disappears, but don’t let the pan go dry. Remove the vanilla pod; rinse and dry it, then store. Mash the apples a potato masher if necessary, but proper cooking apples usually just need a good stir to make fluffy, thick apple compote. Use within one week, but it freezes well too. Uses: in yogurt and cottage cheese, on pancakes, with cake, as a pie filling, to accompany roasted and grilled meat and game, alongside mackerel, mixed with fresh fruit and topped with nuts, just as a wee healthy snack. both the gingerbread & compote look amazing! GG would be really proud – great post. Have just made your lovely recipe from last year, crispy and sticky black pepper tofu …… D luscious!!! Fantastic Emma! I take it the girls ate something else?? I just learned about a new celebration! 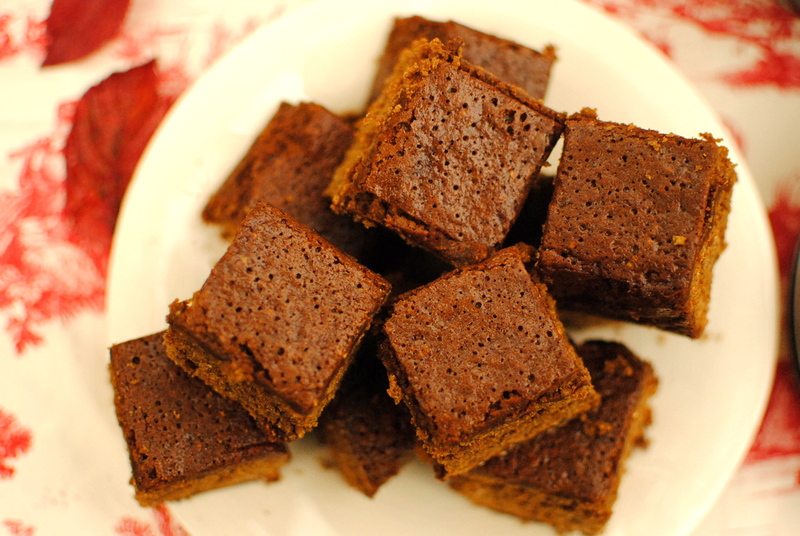 Sticky gingerbread sounds amazing and I love the ingredients you used! A bit more calorific than my norm, but hey! It’s tradition! It really is fantastic cake – one of my favourites. Ooh it looks so delicious! Love gingerbread! Oh, my! Happy Bonfire Night! Great food! Yum! I love sticky gingerbready things. Not sure about waiting three whole days, though! I know! I’ve hidden it under the bed in the spare room. Monday can’t come soon enough. Although I don’t think our animals will be thinking that (the fireworks). What a fun memory! It must make the house smell delish! LOL! It certainly has a kick from the three gingers. I hope you’re feeling great and that everything goes textbook perfect. Good luck! How do you just keep crankin out these unique and amazing recipes? This one is a tweak on a traditional one, so not particularly unique. But thank you! 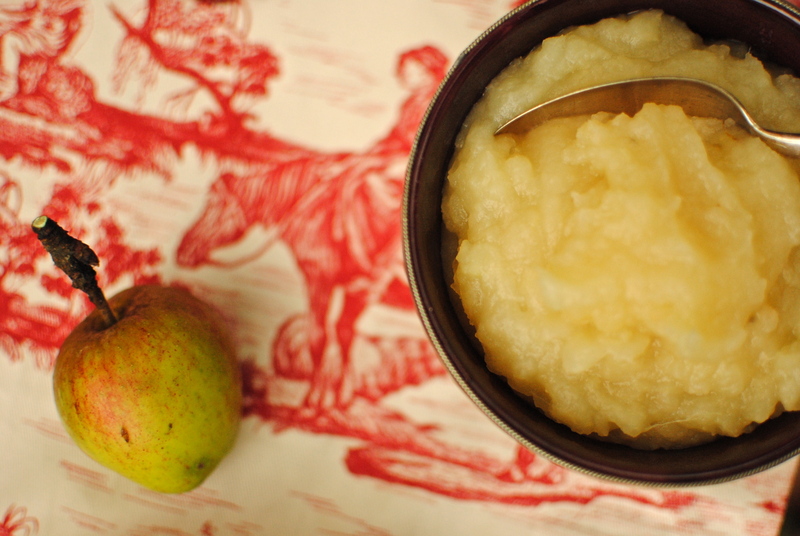 We just had some apple compote on a bowl of slow-cooked (medium) oatmeal – yum! OMG! (never use that but appropriate here) The Washer Up is originally from Preston and is always going on about how amazing Parkin is and how I have to make some! I’ve never tried it (being a soft southerner myself) and now have the perfect excuse. Thank so much for GG’s recipe, I can’t wait to see his face!! Brill!! I hope he likes it. Most recipes call for nutmeg, mixed spice & less ginger (certainly not three) so feel free to make it how he would remember it. It is a fantastic cake. So much more than gingerbread. In oven, smelling good! Had to use half coconut oil because I didn’t have enough dairy free butter, not very “Yorkshire” 😉 but I can see the coconut & ginger working hopefully, fingers crossed!! Oooh, fingers crossed you like it. I had actually considered coconut oil as a fat option so interested to know how that fares. Will you let me know? And, are you maturing it? I kind of like the whole denial then feast thing. Seems more decadent that way somehow. Like you really ‘deserve’ to eat it! “Up in Scotland it’s just fireworks and hard cider (any excuse really)” What d’ya mean Kellie? *downs bottle of cider encased in brown paper bag* I’ve never tasted Parkin before but it looks just the ticket for the colder evenings. Sorry Jacqueline. You got caught in my spam filter (no idea why though) and I’ve only just seen this. We (Scots, not me per se!) took the most exciting elements of bonfire night – explosions and booze – and made them our own! As a Glaswegian at heart, did you see evidence of this? Ditto with the freezing, but an astoundingly pretty day here. Monday night can’t come soon enough for the parkin fest. I shall be saving up by carbs for nightfall! I bet our recipes are very similar cos there is only so much you can do to a parkin and still call it a traditional recipe. Hope you enjoy – and stay dry for – Bonfire Night.As I write (10 pm on Sat) sporadic bursts are interrupting my televisual viewing pleasure (Homeland on repeat). I am envious that you have your own apple tree. I’ve made compote too this year with the apples I was given by the orchard where I volunteer. It goes such a long way in so many things but I never thought to have it with gingerbread. What a great combo. Well, it’s a fairly scrappy looking tree but usually it produces loads of apples. The wind earlier in the year ripped off a lot of blossom from it and our Victoria plum tree. And about 30 feet of our ancient oak came down too! 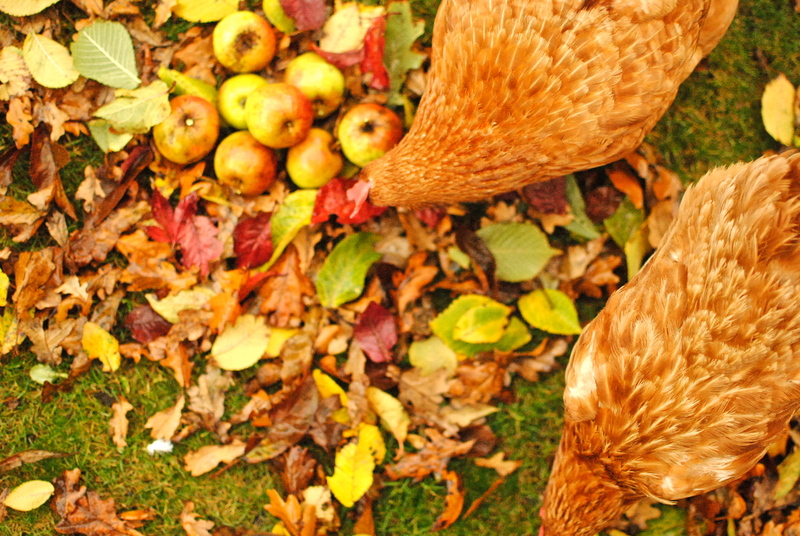 Love the hen pic with the apples. 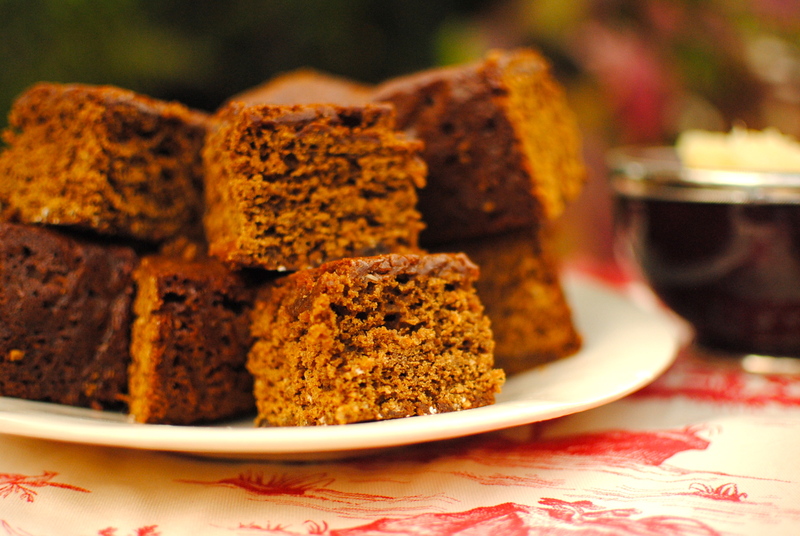 Ginger is one of my favourite flavours and I adore Parkin. Bookmarking this. Thanks, Sally. I can’t imagine you ever have the weather to go with it though! It tastes gorgeous!! The Washer Up is very pleased said it is more gingery than he remembers but he likes that. He is just making the apple compote now to go with it. I can’t wait till later when we can eat it!!! Ihave to photograph it now before it all disappears! He just said that the apple sauce is a fab vegan alternative to custard because of the vanilla! This was such a success, we served it as a dessert warm with the delicious apple compote and a sneaky scoop of vanilla ice cream too, the highlight of our meal thanks so much. I also managed to squirrel some away for us today with a cup of tea!! 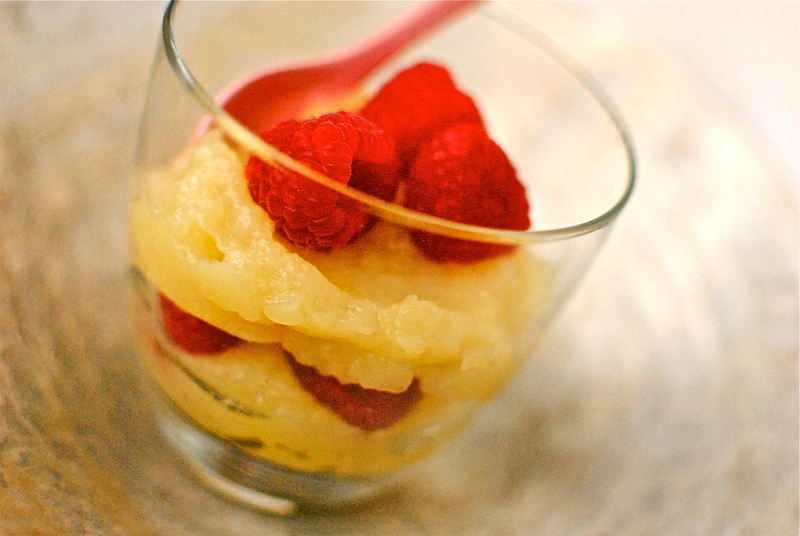 The apple compote is genius, just like custard!! I am so chuffed! love that you loved the apple compote too :-)) The cake freezes really well but because it keeps so well in an airtight container, that’s never happened for us. How did the Washer Up rate it? And did the coconut oil add to the flavour? I’ve just seen this comment after your latest so you’ve answered my question about how Washer Up enjoyed it. I’m glad he approved of the extra gingery taste – there’s about triple the amount of ginger than most cakes! Right now I’m peeling goodness knows how many apples to go in a soup for work & I’ll save some back for more compote. I like it on porridge 😀 Thanks SO much for the feedback, Natalie. Is it cool enough in Andalucia for Parkin? I’m glad the coconut oil didn’t take over. I guess it would depend on how much is used and the kind used – some are more powerfully flavoured than others. Thanks so very much for all the feedback. We both know how much it means to have someone make your recipe and comment on the process and result. Have a great day! Hope it has cheered up. Cool and windy, but crucially, dry. Woo hoo! I know! How good is spicy hot chocolate?! I always make sure there’s cardamom in there too. Anyway, enough of that already, I have a question for you – unrelated to fireworks, dogs or gingerbread. When you talk about food having “freezer burn” what does that mean and how can you tell it’s happened? Thanks in advance & hello to your chickens – nice to see them making a photographic appearance. dangerous but the taste will not be good, nor the nutrients intact. You coming along tomorrow for Maggies Centre 16th shindig? I am currently prepping apples & sweet potatoes for 300 servings of soup…. I do love gingerbread and the delicious compote must go so well with it. I think it is. 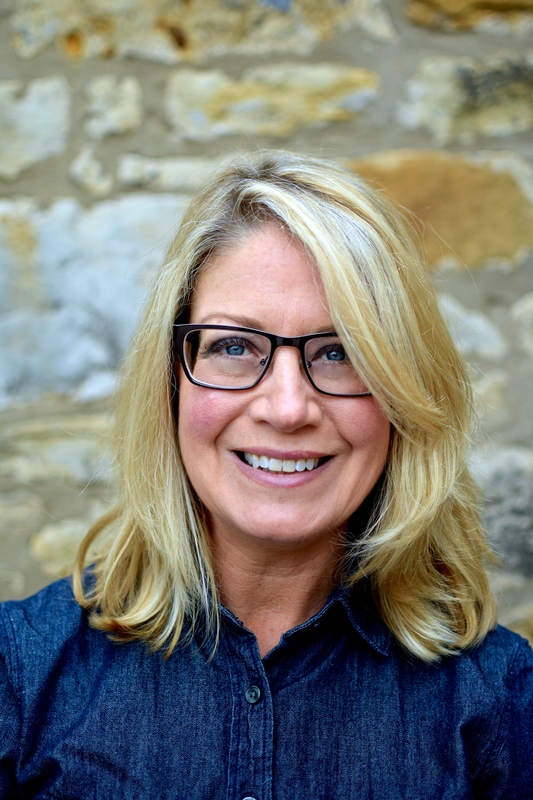 See Natalie from food blog and the dog for her review. She lives in Spain with a Preston-born husband & he seems to have approved. The apple compote is v versatile, as you will know.